US Student Loses Eye After Israel Fires on West Bank Protest | Democracy Now! AMY GOODMAN: We’re going to turn now from the sea to land, to the West Bank. Juan? JUAN GONZALEZ: Well, an American college student has lost her left eye after being shot in the face by an Israeli tear-gas canister during a protest against the flotilla assault in the occupied West Bank. The student, twenty-one-year-old Emily Henochowicz, is in hospital in Jerusalem, where she’s recovering from two surgeries. AMY GOODMAN: She is a talented visual artist, a student at Cooper Union here in New York. Her recent work, available online at thirstypixels.blogspot.com, is inspired by her experiences in Israel and the Occupied Territories, where she had been working as an activist for over a month. In addition to losing her eye, Emily suffered considerable facial damage, including fractures to the bone around the eye socket, cheek and jaw. Jonathan Pollak is an Israeli peace activist who was at the demonstration when Emily was hit in the face by the Israeli tear-gas canister. He’s joining us via Skype from Jaffa. Jonathan, welcome to Democracy Now! Describe exactly what happened and what day this took place. 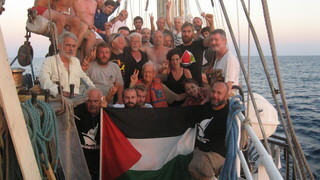 This took place the same day the flotilla was attacked, the next morning. And with the shock of realizing what happened, a spontaneous demonstration took place near the Qalandiya checkpoint south of Ramallah. At its biggest stage, there were maybe about a hundred people there. And at the stage that Emily was hit, there were no more than twenty people. There were clashes, but they were definitely not out of control. There were maybe five youth throwing stones at over twenty border police officers, who were shooting tear-gas projectiles towards them from a very short distance, from a distance of maybe ten to fifteen meters, about thirty feet. And these distances, they don’t have to shoot projectiles; they can throw hand grenades that cause — that only disperse tear gas and cannot cause any damage. At some point, they started shooting these tear-gas projectiles directly towards demonstrators in all directions. We started moving away. Emily was standing maybe ten meters away from where the clashes were taking place. And in these instances, these projectiles are very accurate. The border police officer that shot her shot her intentionally. She was holding — she was holding a flag and was very clearly not a threat to anyone, when she was shot or at any other stage. The projectile hit her in the face directly and caused the very serious injuries that you described before. JUAN GONZALEZ: And Jonathan, obviously this is occurring in the West Bank, where Israel continually points to the progress, so-called progress, it has made in terms of being able to have more peaceful relations with the Palestinians. What has been the reaction in the West Bank, generally, to what’s gone on the past few days? JONATHAN POLLAK: Well, first of all, the notion that Israel is making progress in peaceful treatment of Palestinians is false, to begin with. It’s true that there’s quiet in the West Bank relatively, but relatively to what we’ve seen through the Intifada, but it is not because of Israel progress or a better handling of protest. Israel, in fact — what happened to Emily is part of an ongoing policy of violence by Israel, in which no protest, no resistance, even the most civic of nature, is allwed. And Israel is doing all that is within its power to quash the Palestinian popular resistance, whether it’s in small spontaneous demonstrations in Qalandiya or in the weekly demonstrations in Bil’in, Na’alin, Nabi Saleh, Al-Ma’sara and the other villages who protest the wall and the confiscation of their lands. AMY GOODMAN: Jonathan, we’ve just gotten this breaking news that the US citizen who was killed when the Israeli commandos opened fire was nineteen years old. I’m just looking at the latest news right now. His name was Furkan Dogan. An official from the Turkish Islamic charity that spearheaded the campaign to challenge the blockade identified him as Furkan Dogan originally from Turkey, and it says he held a US passport, had four bullet wounds to the head, one to the chest. That’s the latest news we have from the Anatolia news agency. Jonathan, you’re an Israeli peace activist. What is the reaction to this attack in Israel? JONATHAN POLLAK: Well, inside Israel, pretty much like with anything else, there’s a wall-to-wall consensus that Israel was within its right and did what needed to be done. And the only thing people are complaining about or questioning is the international reaction. The media is very insistent on the fact that the violence was justified, that in fact the soldiers were acting in self-defense and were attacked. They talk a lot about the demonstration —- the violence of the people aboard the ship, and they keep talking about violence and violence and violence towards the soldiers. And I ask, which -—- what violence, really? This was over obviously self-defense. The vessels were in international waters. This was an act of piracy. The commandos, masked commandos, descended on these ships at the pitch dark of night, armed. These people defended themselves, as they were allowed to, as they are allowed to international law. And at any rate, someone who was shot in the head four times and in the torso once, this is not self-defense. This is an execution. AMY GOODMAN: Jonathan, we want to thank you for being with us. Jonathan Pollak is an Israeli peace activist.